Lipase is used as an additive in homemade cheesemaking. 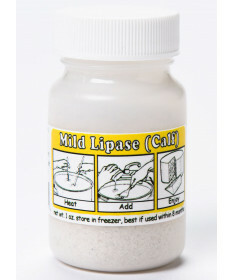 Lipase powder can add either a mild or sharper flavor to your cheese. For cheeses such as Asiago, Provolone, & Feta, a small amount of Italase powder is the perfect fit. 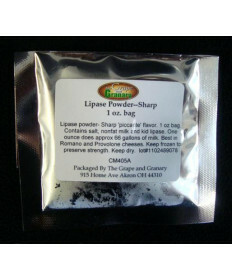 For sharp cheeses, our 1 oz bag of Lipase Powder can give your cheese a sharp 'piccante' flavor. If you have any questions about the use of Lipase powder in your recipes, please do not hesitate to contact us, one of our experts can advise you on the best way to use lipase in your recipe.